龙胆科 Gentianaceae | | 龙胆属 Gentiana | | 蓝玉？龙胆 Gentiana veitchiorum Hemsl. Gentiana veitchiorum Hemsl. in Card. Chron. 46: 178. t. 74. 1909; Marq. in Journ. Linn. Soc. Bot. 48:206. 1929 et in Journ. Roy. Hort. Soc. London 57: 195. 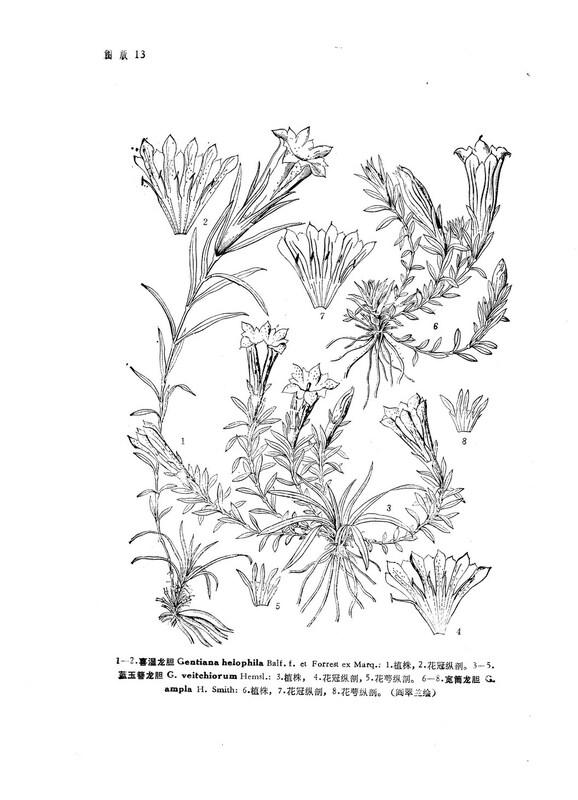 1932; D. Wilkie, Gentians 138. f. 81. 1936: H. Smith in Symb. Sin. 7: 972. 1936; Marq. in Kew Bull. 1937: 159, 186. 1937: S. Nilsson in Grana Palyn. 7(1): 101. 1967;中国高等植物图鉴3: 387. 图4727. 1974; 青藏高原药物图鉴2: 144. 图73. 1978. ——G. ornata var. obtusifolia Franch. in Bull. Soc. Bot. France 43: 493. 1896. syn. nov.——G. ornata var. acutifolia Franch. l. c. 494. ——Gentianodes veitchiorum (Hemsl. ) A. et D. Love in Bot. Not. 125: 258. 1972. 喜马拉雅龙胆 Gentiana venusta (G. Don) Wall. ex Griseb. 五叶龙胆 Gentiana viatrix H. Smith ex Marq. 新疆秦艽 Gentiana walujewii Regel et Schmalh. 小花矮龙胆（变种） Gentiana wardii W. W. Smith var. micrantha Marq.